I recently stumbled upon a sweet and simple Valentine's idea with a gag score of only 2 out of 10. For a holiday that tends to be 10 for 10, a 2 is a pretty awesome score for anti-mushy-types. Not a bad idea for a quick home or office decor fix, or even an understated gift gesture. 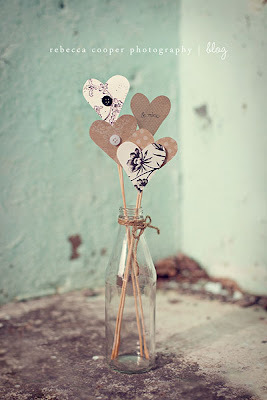 Using paper hearts on pens or pencils is also cute, but I like the thin, elegant presentation in the original. The buttons are swoonworthy, too, I must add. And to think most people deck the halls with nausea-inducing clichés and pinks...sigh. No thanks. I'll take cute prints and buttons and recycled cola bottles, please. With a side of twine. What are your go-to V-day diy's?